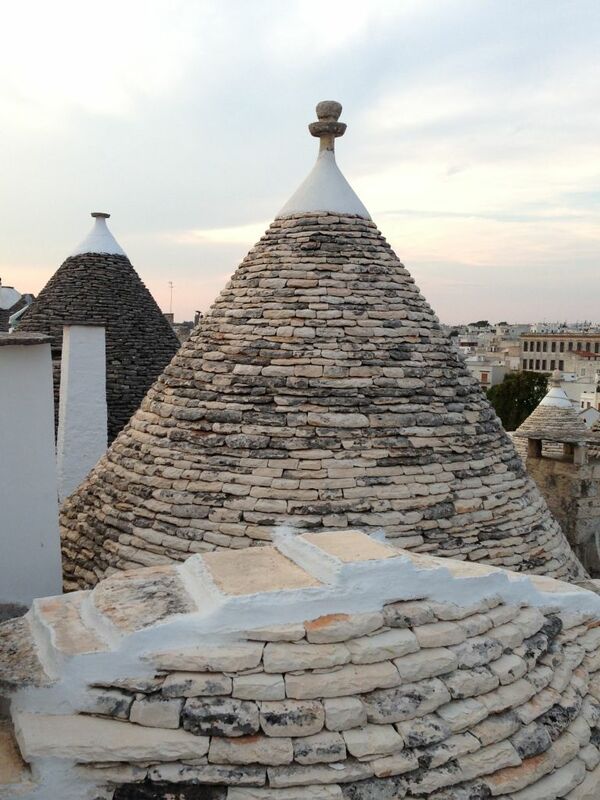 The word “Trullo” may come from Latin turris or trulla or from the Greek tholos, all meaning dome. It is said that probably, the first Trulli were built during primitive times and the traditional buildings have arrived up to our times. They have in common with the primitive dwellings the external form of a cylinder surmounted by a cone, but everything else is an original construction . The Trulli are entirely built in stone: no mortar, or wood, or other means of support or connection are used for their construction. Primitive form and means, but there is nothing primitive in the technique used for their construction, with an excellent static, which allowed them to be preserved and arrive to us in perfect conditions. The Trullo is built on the rock and it has a square base; the main room is the initial core of the dwelling and from here the other rooms can develop: to divide and isolate them there are no doors, but simple curtains. The chiancarelle are the flat stones, 7 cm thick used to cover the roof also used to pave all the rooms. The walls are built with limestone found in the fields. Interior and exterior are then whitewashed with lime milk. The transition from the square perimeter, to the circle at the base of the dome is obtained by forming an octagon. The base of the dome is built so that the dome itself can be used as a storage, that can be reached thanks to wood staircase. 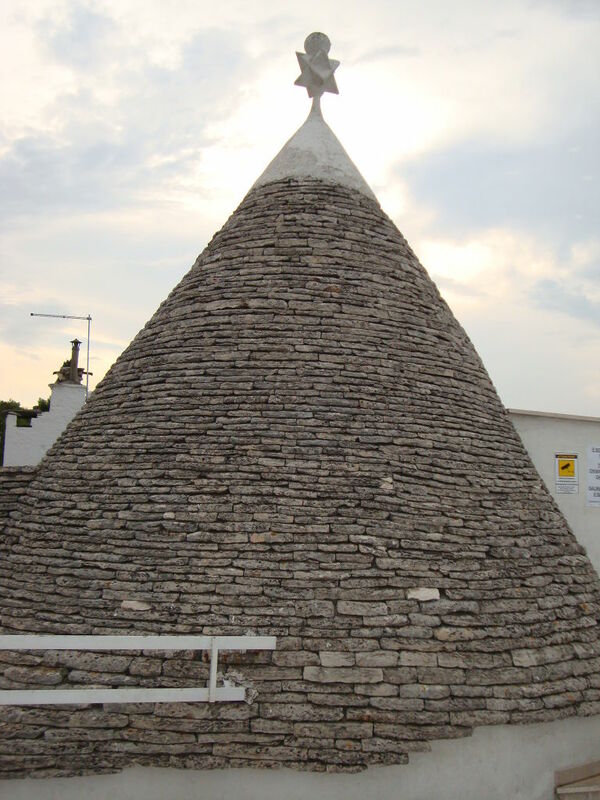 The roof of the Trullo ends with the pinnacle. It is commonly formed by three stones one above the other: one has a cylindrical shape, then there is a bowl-shaped or dish stone, and a sphere or other shapes on top. Its true meaning is still unclear, but several hypotheses have been put forward: some give them a magical meaning, for others they have only an ornamental function, according to the taste of the trullaro (Trullo builder). It is also said that the pinnacle, before becoming ornamental, was a hallmark, useful to the regnant and imposed by himself. 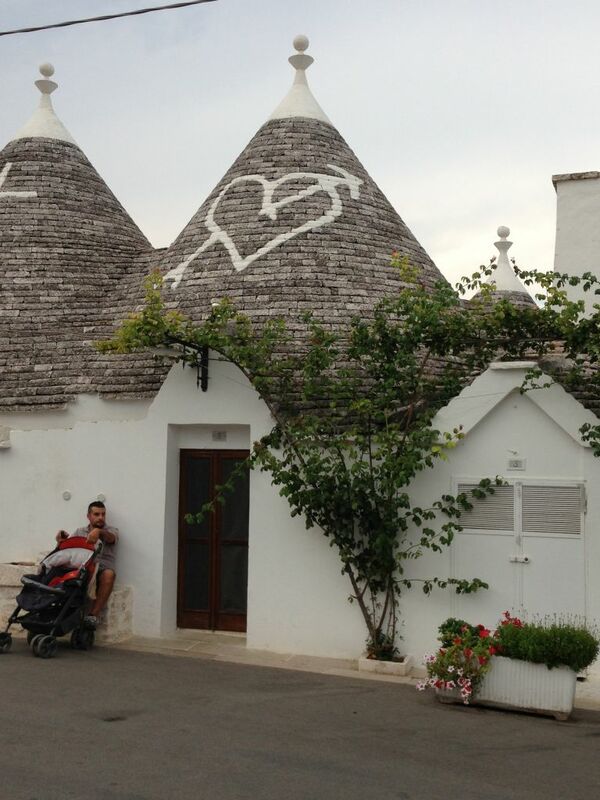 The mysterious white signs painted on the front of the cone of the Trulli are magical and propitiatory symbol. Some come from the pagan tradition, others from the Christian tradition, because in Alberobello used to live people from different origins. These symbols drawn on “chianca” have various meanings; the most common are: protection of the family from evil, propitiatory worship of a deity for a good harvest. Actually, the blonde lady, owner of the open house-Trullo, explained us that probably if on a roof there a cross was painted, it meant that inside there was a family, which supported the powerful Conversano family, ruler of Alberobello. This way, they could enjoy some privileges from Count Conversano.